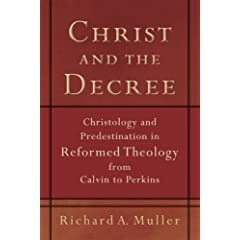 I’ve been slowly working through Richard Muller’s Christ and the Decree. It is always humbling reading Muller as the range and grasp of his historical understanding is monumental. If you want to know about Christology and Predestination in reformed thought from Calvin to Perkins then you need to read this book. However by way of warning, to understand Muller a substantial dictionary is required (think sesquipedalian) as well as a copy of his Dictionary of Latin and Greek Theological Terms. There are three principal times which embrace the whole world: the first which was before the law, the second under the law, the third after the law. Then also there are three designated persons, the leaders of the separate times, Abraham, Moses, Christ. And each time had its own dispensation [administration] of religion, which is called in scripture berith, i.e., pactum or foedus. It does not follow, however, that there are three substantially distinct covenants (foedera) as far as the salvation of mankind is concerned. There is one God and Father of all, who is above all and through all and in all. There is one Lord, saviour and redeemer of all, Christ Jesus; one Holy Spirit; one kingdom of the elect and blessed prepared since the beginning of the world; one grace of heavenly calling; one faith; one hope of life eternal; there is one body, one people, and one universal church of the elect properly so-called, which from the beginning of the world to its end embraces all the elect and the faithful: and (thus) there is a single and perpetual covenant of God with the elect in all things firm and sure, and there is one ongoing worship (pietas) and justification of believers. Truly, the dispensation of this one covenant, grace, faith, church, religion and worship is not one and perpetual: rather it has been instituted in several ways and according to the quality of the times by the counsel of divine wisdom. What exactly is being offered in the gospel? This is a short extract from the talk I gave at the Scottish Reformation Society in Inverness. I am hoping to get a slightly ammended version of the lecture published in the summer. Watch this space. PS Blogging may be slow over the month of December as we are moving to Cambridge shortly and internet access will be limited for the first few weeks. Normal service will resume in the new year, DV.